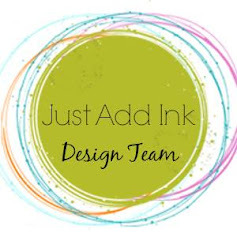 Welcome to this months Stamp to Share International Design Team Blog Hop and my newest blog venture. 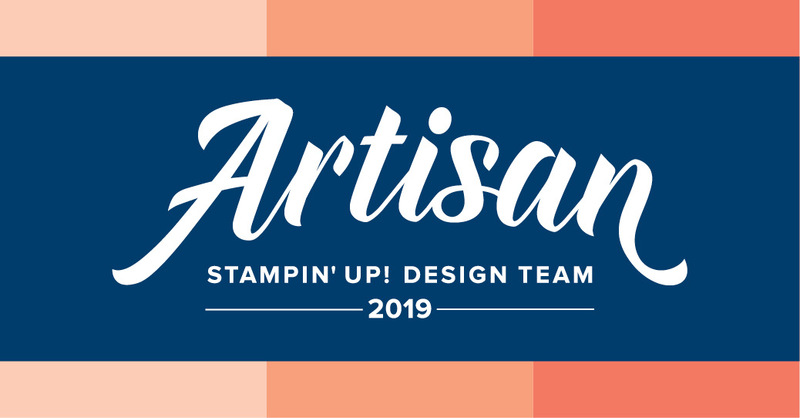 I'm super excited to be the newest member of this design team and super excited to share my first blog post with the Stamp to Share gals. Thanks so much for having me! 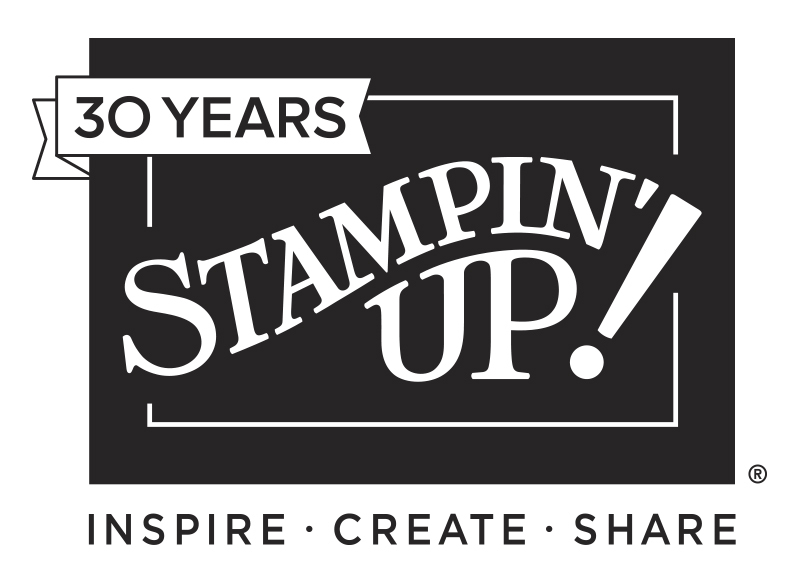 Stamp to Share is a monthly blog hop featuring nine designers from the Stampin' Up! markets around the world. Once every month we will each feature two projects showcasing one Bundle of Stampin' Up! product to inspire you. 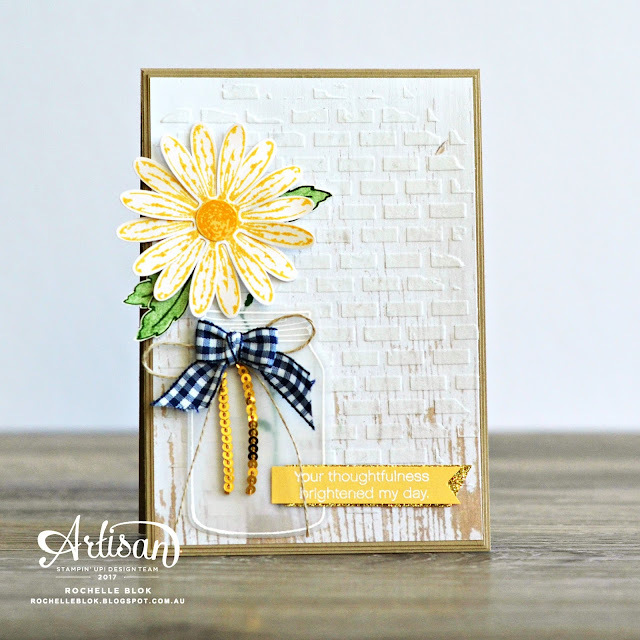 This month we are playing around with the amazingly popular Delightful Daisy Bundle. 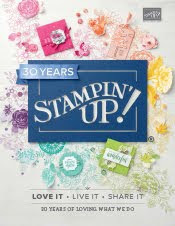 Due to Daisy Punch, that is part of this bundle, exceeding all of Stampin' Up! 's sales expectations, here in the South Pacific market, this bundle is currently unavailable. We are currently waiting for the stocks of the daisy punch to be replenished. While we wait, the item numbers have been switched off for the Daisy Punch and the Daisy Delight Bundle to prevent the Daisy punch from being in a near-permanent back order status. The good news is that you are still able to order the stamp set on its own. Its just the punch that is unavailable for a short while and it should be available again in a few weeks time. While you wait for the punch to return to stock we are showing you lots of ideas that you can pin in Pinterest or save in your memory bank and have ready to go for when the punch does come back. Maybe you can try some of these ideas with a little bit of fussy cutting in the meantime. I've got two cards for you today on CAS (Clean and Simple) and the other with a little bit more detail. 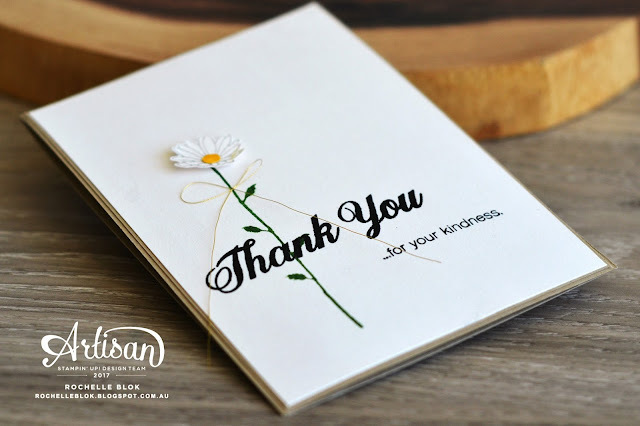 This card is a great Thank You card if you need to make lots of them to give out. I'm loving all that white space with this one and then the dramatic clear embossed black thank you and that gorgeous daisy standing on its own. I used Garden Green to stamp the daisy stem and then stamped the daisy in Smoky Slate for a softer outline rather than black which can sometimes be a little harsh. I then stamped the daisy image again with Daffodil Delight Classic Ink on So Saffron Cardstock. I then fussy cut out the centre of the daisy to get that bright yellow centre. 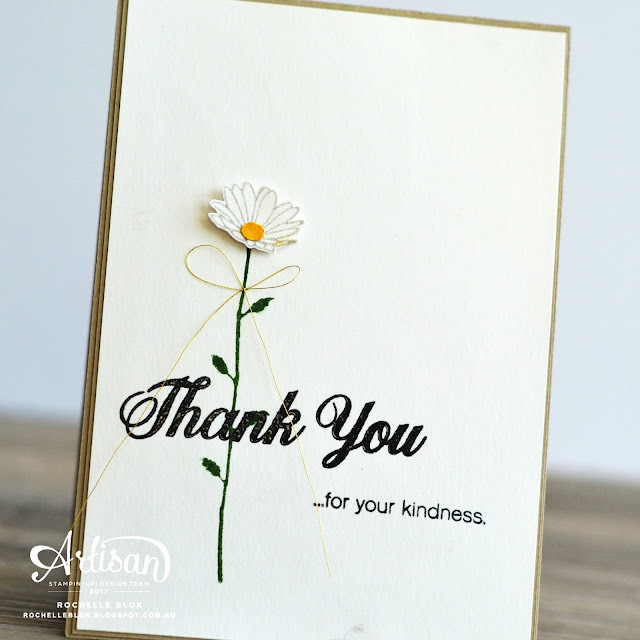 As we don't have Basic Black Embossing Powder, I first inked up the 'Thank You' with Versamark Ink and then inked it up again with Tuxedo Black Memento Ink. 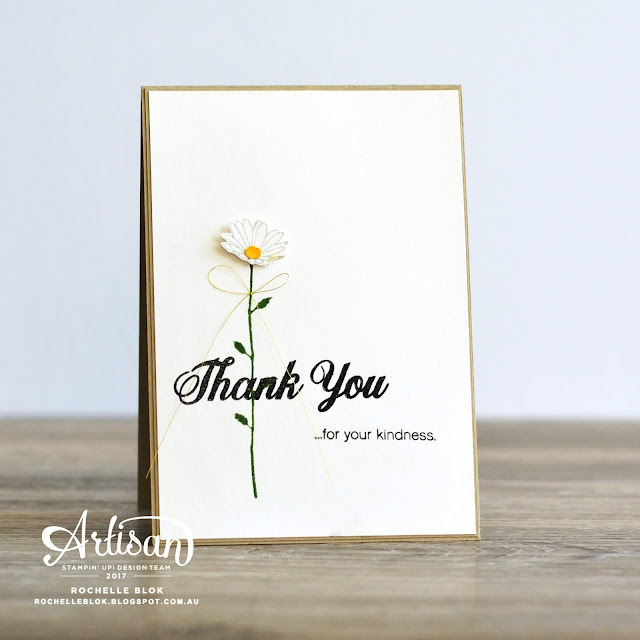 I then stamped down the 'Thank You' and then quickly poured over Clear Stampin' Emboss Powder for that shinny look to the sentiment. The clear embossing powder just makes the card look a little bit more special but still is keeping with that CAS look. I hear you ask 'Why use black Memento ink when Stampin' Up! has the Basic Black Archival ink?' Fabulous question. The answer is because this set is a photopolymer set the archival ink can stain the photopolymer. I like to use the Memento Ink as you can clean it off the photopolymer stamp sets using the Stampin' Up! Stampin' Mist Stamp Cleaner. To keep with the CAS look I added just a small bow to the daisy stem using the Gold Metallic Thread. Pretty! The second card uses the large daisy image from the set as well as some other new products from the new 2017 - 2018 Stampin' Up! Annual Catalogue. I knew I wanted to use the large daisy image and also the new Night of Navy Gingham Ribbon. I thought they would go well together and give a bit of a rustic feel. My card then evolved from there. To get the full daisy look you need to stamp 2 of the daisy images, punch or cut them out and then lay one on top of the other to get that full effect. I did just start with having the daisy in the jar with a crumb cake background but it was 'missing' something. I kept looking at it and played around with DSP and the thought the Wood Textures DSP stack would continue with that rustic feel and then I thought what about some embossing paste too! How fabulous is that brick pattern from the Pattern Party Decorative Masks? 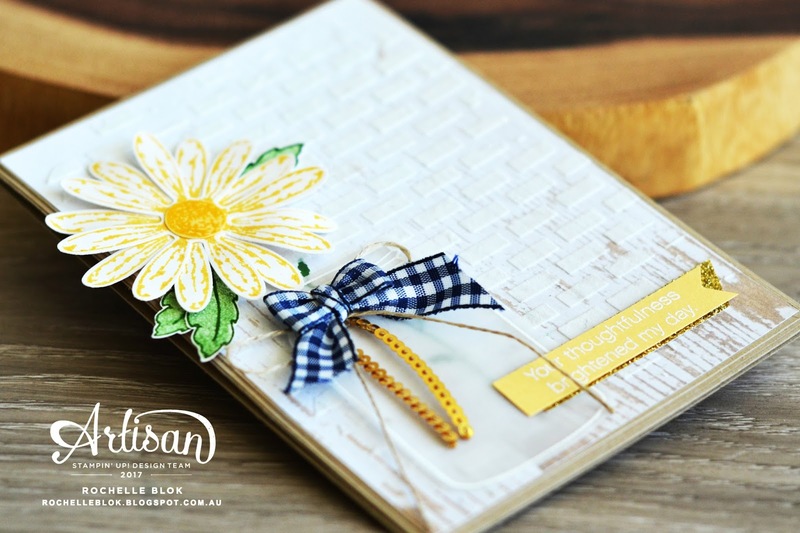 Love the texture of it and loving the look of the embossing paste over the DSP for more of that rustic element. How cute is that little jar? That is from the new Ronald McDonald House Charities Stamp Set - Sharing Sweet Thoughts. 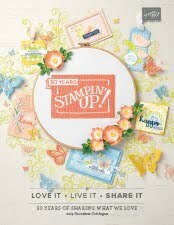 It is super cute and for every one of these stamp sets sold Stampin' Up! will donate $3.00 AUD to the Ronald McDonald House Charities. Not only do you get a fabulous stamp set but you are also supporting a very worthwhile cause. Another fabulous thing about this set is that it co-ordinates with the Everyday Jar Framelits Dies from the 2016 - 2107 Annual Catalogue. The 1/2" Gingham Ribbon is just gorgeous! Love, Love, Love!!! It comes not only in the Night of Navy colour but also it Smoky Slate as well. Cute, Cute, Cute!! I do hope that I've given you some more ideas on using this set. If you are waiting for the punch to come available again there is always the option of fussy cutting with the Stampin' Up! Paper Snips. Now on to Sandi MacIver in Canada with her amazing creations! She is just fabulous! 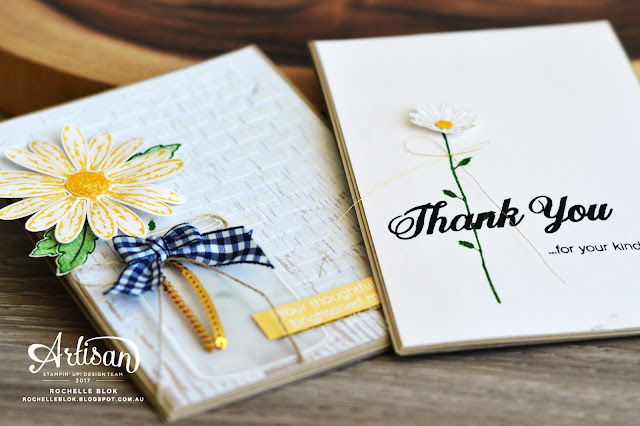 Recreate these cards at home using the following Stamin' Up! products. Click on the images below to see the product information and to shop from my online store. Cute projects Rochelle, I'm a clean and simple girl and the first card is stunning. Thank you Sandi and thanks for having me on the DT! 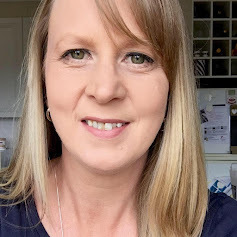 Rochelle welcome to our Stamp to Share team! It is wonderful to have you aboard. I love both your cards. I love the simplicity of the first one, which makes it strong and I love the structure and the use of the jar on the second one, which makes a great combination. Thank you Caroline! SO happy to be on STS with you all! You are killing me! You can do CAS AND complex and make both look like works of art! My fav is the heavily textured card, but I want to CASE the first one as I so struggle with clean, simple designs. I would say you have joined this team with a bang! So happy to have you join us! Ha! Thanks Paula! I don't normally do CAS either but really loved the look of this on. Sometimes its good to pull it all back! Thanks for your lovely warm welcome! Both are great cards. I especially like the first one with the clean, simple look. However, I also really like the rustic feel of the second one. I may cas them both! Thanks for sharing. Dear Rochelle, very welcome to our Stamp to Share Team :) ! Love your beautiful cards :) . The second card with the lovely flowers in the glas are so cute and the embossing paste give them a special look. Your first card is cute, too. Love the clean and simple look :). Thank you so much, for your ideas and sharing this. Beautiful! Especially love the card with the mason jar and gingham ribbon!